Better than season 1, but still dismal. I liked Yuki's post-traumatic stress behavior, which was the reason I gave this season a try. It was a relief having her emotions at the forefront, instead of the previous season where she was constantly consoling the suicidal Zero. I usually enjoy heroines in torment, but they didn't do much with it. She continued obsessing over Zero and repeating the phrase, "I cannot hurt Zero any more than this" in her monotonous internal dialogues. She also kept on chasing after Kaname, begging him to tell her about her past. This dragged on WAY too long. I can take only so many scenes of Yuki crying and pounding her fists against his chest while he goes, "Yuuki," in his sad voice. Unlike season 1, there was some buildup to the final events, the villain was decent, and there was some resolution. However, the story was so boring and the characters' behavior so repetitive that by the climax, I just didn't care. The art was similar to season 1. Decent, nothing special. I was disappointed but not surprised by the cheesiness of the monsters and the lameness of the fight scenes. One treat was how cute Chairman Kaien was once he let down his hair and took off his glasses. Another excellent soundtrack. Just for the music, suffering through the two seasons was worthwhile. I hate the intro, but the ending theme makes up for it. Yuki was unbearable. She was as weak as ever, but much more intent on protecting everyone, even though she had ABSOLUTELY no capacity for doing so. Watching her chase after the villain and put herself in danger was really irritating, especially because she endangered a lot of Kaname's lackeys in the process. Kaname did improve somewhat; he was less opaque and we finally understood his attachment to Yuki. Zero and Ichirou also gained some depth. The twins may have been the most powerful, compelling plot element in the entire show. They shouldn't have raised our expectations that Yuki would become strong if they weren't going to deliver. They did nothing with her being the guardian. If the main focus was the love triangle, then they should have put WAY more attention on developing the two relationships. Yuki spent a lot of time with Kaname and Zero, but she didn't connect with Kaname until the end, and her scenes with Zero were just angsty melodrama. I can't remember a single romantic scene in either season that I would rewatch, and I'm usually pretty enthusiastic about corny shoujo moments. I'm truly shocked by this show's popularity. 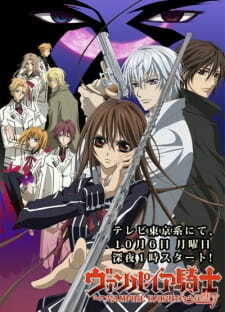 First and foremost, I write from the perspective of a dissatisfied audience of Vampire Knight Guilty. It was due to my positive opinion of Vampire Knight that led to me to Vampire Knight Guilty and hence my judgement cannot make dichotomies of the two (so I hope you don't mind me making reference to Vampire Knight). As you'll probably know, VKG continues right where VK left off, retaining much of VK's good qualities at first. The characters from VK/VKG are very well-built and generally three-dimensional enough for me as an audience to relate to and hence enjoy, with the exception of Kaname-kun, who was so perfect in his prestige, power and popularity that there was no room for him to be anything but an admirable and incomprehensible figure. The artwork itself was generally quite well-done, although I felt the quality didn't follow through towards the end of VKG. In terms of sound, nothing stood out as being special but nevertheless, it complimented the plot and character developments. The one thing that I really want to talk about is the storyline. The reason why VK was excellent in my opinion was its plot. The flow of the story introduces audience to a very different and intriguing world of vampires, and as you journey through the plot progression, mysteries of the world and its creatures unravels itself through introduction of new characters, philosophies and events, that spices up and quenches curiosity of the world whilst requiting the audience a greater interest in knowledge of vampires and their existence. And so VKG begins with this highly anticipated and built-up plot where most branches of side and main plots from VK was left wide open. However, as the story progresses in VKG, the pace of the story really dies down. Excluding a few snippets of fair back stories to some of the supporting characters, the main plot really felt mundane and hard to trudge through. Due to an overly pretentious overemphasis on subtle foreshadowing, the climax of VKG comes about in a very poor, but surprising way, which in its own was interesting. VKG was on a road to revival, bringing back the essences that made its preceder a success. Inevitably, due to lack of pacing in the story, VKG ran out of time to wrap up properly, failing to arrive at the respectable conclusion that VKG's climax opened up for. In all honesty, the conclusion simply felt rushed, as if the writers just ran out of time and whipped up a mediocre ending and forgot about all these other things. Having enjoyed VK, it really was a pity that VKG did not follow through. VK felt like it created so much potential for VKG, who grabbed a single point of interest and neglected the rest of VK's successful elements. To sum VKG up, it centralises on one element of a good script, then patched a drawn-out and repetitive build up to its front and a short and undermined continuity to its back. It was not bad, but the fact that it was a mere shadow of its former annoys me, and so I give it a 6/10 (it's simply my opinion). What started out as a very good continuation of season one, and loyal companion to the manga (which I am sad to say, I did not know, too the exact same turn as transcribed here) ended up being a major disappointment in the way of a Shoujo anime. I don't normally affiliate with the genre, and this series reminded me why. The abrupt ending of Zero's affection for Yuuki given the circumstances involving her having been a pure blood vampire this entire time was nothing short of a kick in the teeth. To watch 26 full episodes of them going back and forth with each other in one of the most twisted and abusive love triangles I have ever seen, only to find in the end because Yuuki was never who Zero thought she was he can no longer love her? Admittedly there is some bias to my words. I preferred Zero over Kaname only because the latter of the two was a self absorbed prick who's soul intent was roughly the same as Zero's later on in the series. I don't really feel that the story for both the manga and the anime were all that in depth as so many things could have been done to prevent the overall conclusion, everything just seemed to happen because one vampire wanted to be strong. For some reason, however, no one ever thought to band up and kill him all at the same time? And why exactly did he need to drink Yuuki's blood? Overall, a very bad series that sadly had great potential. I was so excited when I learned they had made a second season but was greatly disappointed when I watched it. It varies from the manga too far. They fail to introduce an important character, that triggers a major scene with Yuki having to finally confront her feelings. Plus if you were looking forward to the big battle with the big bad uncle, prepare yourself, it bit! It was over in 2.5 seconds and Kaname is the major player instead of Yuki! It was total garbage and I wish they had just waited for the manga so the full 13 episodes could have been exact. Course that doesn't explain the earlier change to me.